I wish I could go with the crowd, not be an accidental iconoclast. I just to seem to have a powerful resistance to almost everything to which people go gaga for. I was not impressed with the Harry Potter series (I read only the first book and thought it was not good). I did listen to the audiobook of the first Twilight book and KNOW it's awful. It just seems I have a powerful resistance to whatever the latest craze is. Now I find myself doing the same thing with The Hunger Games, the film adaptation of the first of Suzanne Collins' trilogy of young adult books about a world where children are rounded up to fight each other to the death. Given the fanaticism of the readership and the hyper-venting of other critics who think The Hunger Games is the Citizen Kane of YA adaptations, I fear I may get trashed for not liking it. Not like it, however, I most certainly did. 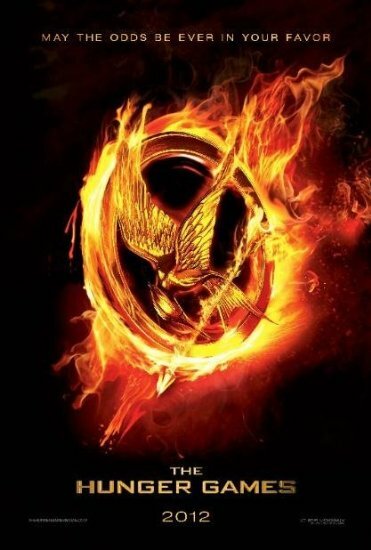 I think in another post I will get as to why I found The Hunger Games both repellent and a cheat, but here, I shall stick to the movie, and as to why I found it a disappointment given how others are going on about its 'genius'. Katniss Everdeen (Jennifer Lawrence) lives in District 12, a very poor district in Panem, a dystopian version of North America. Every year, two children ages 12-18 are selected from the twelve districts to participate in The Hunger Games, where these 24 kids will kill each other until only one is left, the winner living a life of luxury. This is done as punishment for a failed rebellion (I hope Bashar Assad doesn't get any ideas), and are broadcast throughout Panem for the public's viewing pleasure. At this, the 74th Annual, Katniss volunteers to spare her sister Primrose (Willow Shields) this fate. The male from District 12 is Peeta Mallark (Josh Hutcherson), the baker's son. Soon, they are whisked off to The Capital, a center of wealth and decadence. Under the tutalage of minder Effie Trinket (Elizabeth Banks), mentor Haymitch Abernathy (Woody Harrelson), and stylist Cenna (Lenny Kravitz), Katniss and Peeta are trained to get the public to love them, which will give them sponsorships (and thus a better chance for one of them to win the Hunger Games). We see them trained in the arts of death (although Katniss is already handy with her bow and arrow, which she uses to hunt for food), and then it's off to the killing fields. With Game Master Seneca Crane (Wes Bentley) in charge (and being able to manipulate the circumstances in the field), the kids start going off after each other. The Games even have a host: Caesar Flickerman (Stanley Tucci), a sleazy type who oozes insincerity as he introduces and interviews the "tributes" and serves commentary to the games, along with co-host Claudius Templesmith (Toby Jones). Now it's a struggle to survive. Oh yes, we have Katniss showing affection for a tribute from another district, Rue (Amandla Stenberg), and we also have Gale Hawthorne (Liam Hemsworth), a boy who is a friend of Katniss and thinks the Games are evil. We end with Katniss AND Peeta returning in triumph to District 12, much to the distress of Panem President Snow (Donald Sutherland). Now, you may have noted that the Hunger Games have ONE winner (bringing to mind Highlander: There Can Be Only One), but we end with BOTH Katniss and Peeta coming back alive. I figure this stays true to the source material (given that Collins co-wrote the screenplay with Billy Ray and director Gary Ross) but once we get to this point in the two-and-a-half hour running time of The Hunger Games, even non-readers of the trilogy like me know that whatever tension in the story the plot has is (or should be) thoroughly gone. One has to be really intellectually weak to NOT figure that Peeta will live to be part of Catching Fire and/or Mockingjay. With that, we don't really fear for either of our protagonists: we KNOW Katniss will live (it's extremely rare that the main character is killed off) and now we know that Peeta will live. I think it was at this point that my view of The Hunger Games just went down to where nothing short of a personal appearance by Laurence Olivier and Vivien Leigh would have lifted it. For most of the movie, I wavered tremendously over what I would argue are a myriad of problems that are being ignored in a mad, lemming-like rush to praise what The Hunger Games was going for. Chief among my issues with The Hunger Games is the shaky camera work that is a plague on modern filmmaking. It is in the opening of the film that we get the camera moving wildly to where you can't see clearly what's going on. This may be effective when we come to the actual Hunger Games because that way the film could get away with telling a remarkably violent story and keep a PG-13 rating. However, even when it clearly isn't necessary (ie. no running being done) the cameraman appears incapable of keeping things in focus. Two or more characters could be having a conversation and Ross appears determined to make a simple talk look chaotic and confused. In terms of the story, I imagine The Hunger Games suffers from the same problem most Harry Potter adaptations faced: the stories in the books are so expansive that I imagine a great deal was cut to fit into one film; paradoxically, a great deal of information had to be put for the non-reader so as to give an idea of how things came to be (which makes The Hunger Games feel even longer than it is). It isn't impossible to have a faithful film adaptation of a very lengthy novel (Gone With the Wind is a good example). However, there are two differences. One, a great deal of the novel had to be cut, and in particular characters had to be sacrificed. Two, Gone With the Wind HAD to be long to get the thrust of the story and audiences (of which the majority had read the novel) understood that. The Hunger Games doesn't have that luxury. It has to tell its quite lengthy story in a compressed time, but rather than sacrifice characters (such as Gale, who has nothing to add to this story but one imagines is relevant to Catching Fire and Mockingjay), Ross and Company opted to sacrifice time (the training goes by so fast one wonders why even bother) and character development (how long or whether Peeta actually carried a torch for our prickly Katniss are questions left unanswered by the time they roll into District 12). With the story being so lengthy, we get very few hints about the characters or their plights. For example, The Reaping (the selecting of the sacrifices), is over so quickly that just how grueling this is goes by with barely a note. I digress to wonder whether the Reaping in Districts 1-11 is this downbeat or is it a perverse moment of celebration. Katniss' dramatic decision to take her sister's place (Katniss' Choice? ), a moment filled with drama, even sadness, just pops in without the tension, the fear, the horror that one imagines the book would have covered. This is the first time (at least in a long time of the 74 years this has been going on) that District 12 has had a volunteer, yet, despite this dramatic turn, it's almost as if it ISN'T a big moment. As for the selection of Peeta, it has even less dramatic tension because we don't know who this guy is. This inability to know our characters, both good and evil, hampers us in an even greater way with the character of Gale. He is at the beginning of The Hunger Games, pops in very briefly in the middle, then pops in at the end. Given we don't truly establish the extent of Gale's relationship with Katniss, one wonders why he is in the story at all (apart from just establishing his need for the film versions of Catching Fire and Mockingjay Parts I & II respectively). One shouldn't have a character in a film because he'll play a bigger role in the inevitable sequels. Why not just introduce Gale in the film version of Catching Fire, rather than waste time introducing him in The Hunger Games but giving us virtually no idea as to who Peeta is (who is more important to the story)? The same goes for the other tributes: we get faint hints of who they are (the tributes from the wealthier District 1 & 2 are bad because they appear to enjoy killing) but the others are of no importance (especially since they are dispatched within the first five minutes of the actual Hunger Games). Their casual extermination was a concern to me, given that I imagine they had lives outside the Hunger Games, not just props for Katniss to overcome. Even the connection between Rue and Katniss is a puzzle: why does Rue take a special shining to our heroine given they don't have any interactions in the training? All these questions, which I figure are answered in the book, go unanswered in the film adaptation. Again, I suspect it's because there really is so much ground to cover (no pun intended) that those things called character development are of little to no importance. We had to get on to the gruesome killing spree of children and teens. I digress to say that though The Hunger Games' fans would argue the story is painting a horrific picture of this wholesale slaughter for the enjoyment of The Capital, I think The Hunger Games is shockingly dismissive of the truly monstrous nature of the spectacle. Given that from what I saw watching the Hunger Games isn't compulsory in the twelve districts, one would agree with Gale when he said if no one watches they won't have the Games. From what I saw in The Hunger Games, people don't watch because they enjoy it (except perhaps in the Capital), more because they are fearful for their children. When Rue is killed off, it appears to spark a District 11 Spring (to which I would say, fine time after 74 years of putting up with this nonsense). Even what appears to be the first stirrings of an uprising against the Capital is pretty much forgotten because we had to go find out who lived and died (which frankly wasn't going to be a big surprise). Finally, in terms of the script, if there's one thing I detest is the Deus Ex Machina (or DEM as I call it), that person or thing that will appear, almost like magic, to resolve the character's dilemma. The Hunger Games has quite a few (in particular at the actual Hunger Games), with the biggest being the "we'll let TWO of you live this time" bit. There are good things within The Hunger Games. You have a strong performance from Lawrence (who is one of the best of the young & upcoming actors and actresses around) as the strong, almost fearless Katniss. It's unfortunate that the screenplay kept Katniss at arm's length, making her perhaps more aloof and remote than she should have been. However, I figure this is part of Katniss' persona, so I'm not going to be harsh. Tucci kept a strong balance between being sinister and merely sleazy as the insincere faux-fawning host. A surprise was Kravitz, who while having virtually next to nothing to do as the stylist managed to make Cenna someone who took an interest in Katniss. However, everyone else appears to have made their characters one-note. You had Harrelson as the perpetually drunk Haymitch and Banks as the birdbrained and insensitive Effie. Sutherland looked like he had escaped from making The Walt Whitman Story, unable to make President Snow menacing. Bentley as Seneca only served to be a Christoph from The Truman Show substitute (except instead of being bald, Seneca had one of the funkiest beards in film history). In regards to the Hutcherson and Hemsworth, it was a Battle of the Blands. Peeta's main shift was between pining for Katniss and not pining for Katniss. What fears he had about the Hunger Games go unanswered (because let's face, he's not as important as Katniss). Oddly, whenever we do get into a potential Katniss/Peeta romance (the veracity of it always questionable), The Hunger Games slows down considerably. Gale was on screen so briefly that again, I wonder why he was in the first place. I wish I could have been as enthusiastic about The Hunger Games as both my professional colleagues and my friends are. I've already had two people tell me they aren't surprised I didn't like it, as if I deliberately go against the grain just to go against the grain, to be the naysayer, the one who just likes being contrary. That would be hurtful, but in truth, I think it says more about their narrow-mindedness than it does about my alleged narrow-mindedness. I take pride in being forthright about why I like or don't like something, and I found much in The Hunger Games to put me off. I thought most of the acting was one-note, the story disingenuous, even hypocritical, about what it claims it wants to say about the contemporary world, and filled with too many easy outs for our protagonist. I know I should declare The Hunger Games to be this epoch-changing cinematic experience to rival the introduction of sound or color, but while financially this film is a giant success, to me, The Hunger Game's a flop. May the odds of a better film be ever in our favor. Good review, I liked how you did pick out the goodness of the movie with Jennifer Lawrence being an upcoming actress, as much as it was violent, I did put myself in the movie and making my own strategies. My flaw with the movie was when they started, they were altogether and the weapons and supplies were right in front of them. And I do agree that the camera work was off, they needed to control that. The way I see it, it was The Olympics,The Oscars and yes, the video game Halo all rolled up. I did enjoy it, but yet until the part where they changed the rules and now that I think about it..."What about the ones in a District that already had someone killed?" You do bring up a point also of the kids from the other 11 districts...what was their story, anyway good review once again and I'm still weary of adding this to my collection when it comes out on Blue Ray.